The best thing about a planner is how it takes away stress. But a planner won't work if you don't make an actual plan. The first step in a plan is identifying what goes into the plan. I called those first, most important items fires. 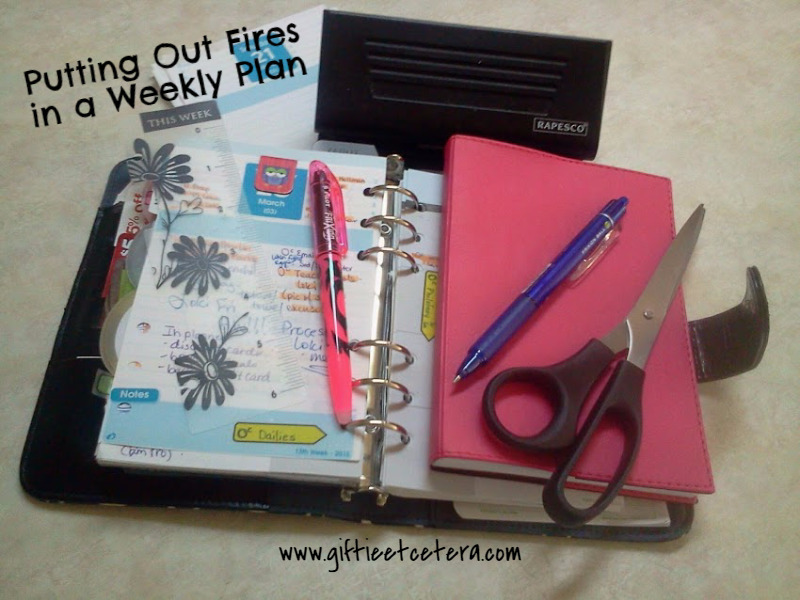 Each week, I grab my planner, my daily pages (torn out and hole-punched here from a Quo Vadis bound planner into my Franklin Covey ring bound), and my weekly spread, and make a plan to put out the biggest fires. Fires are things that, left alone, will become overwhelming or out of control. This week, that includes a work project, shopping for Easter, and packing for a quick road trip. All of those things get worked into a weekly plan - and sometimes onto a subsequent daily docket - so that things never get out of control. Absolutely agree. And building those things into your weekly plan allows you to stay ahead of them. There is tremendous peace in being ahead instead of behind! Yes. It's important to keep those "fires" from developing. This week & next, I have some extra work obligations that will eat into my time (but at least they are mostly fun things.) Plus I really need to get some personal financial stuff done on the computer! These might be called "controlled burns" -- they are fires that are known about in advance and can be planned for. How do people deal with the arsonists and the spontaneous combustion in our lives? Mine seems to be full of both, and they are the main source of stress.